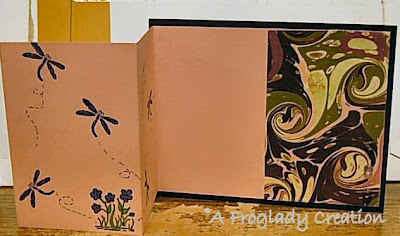 I love this card fold - it is easy and impressive when done! 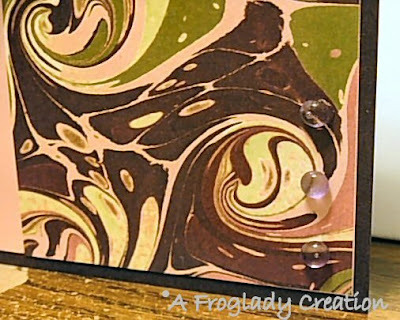 I used peach and brown paper for this along with patterned paper (can't recall who it is from) with a bold swirl pattern that I really liked! I added the flowers and the dragonflies to the front and front inner portion. I colored them with my Spica glitter pens and markers. IN the close up here you can see that I added pinkish dew drops to the one edge of the patterned paper - I love those things! They add such a nice touch to the pieces. Isn't that patterned paper just gorgeous too! I love it! Anyone know who makes it so I can get some more?